Sometimes, you just got to bear down and roll with it. Rolling out that tight IT band on a foam roll? You may not like it–but you know you love it! 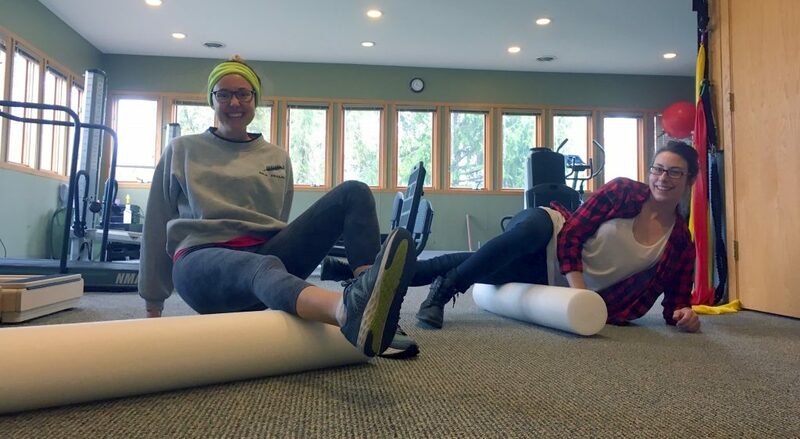 In this workshop, you’ll learn how to use foam rolls and other tools to roll out tender points in muscles and loosen your fascial tissues while increasing circulation. For those of us who don’t have our own personal massage therapist at home, the simple foam roll can be an amazingly effective form of self-care. We’ll show you how to follow lines of tissue and muscle synergists for a more complete release of tension. This is the first of a two-part workshop series. We’ll focus on the lower body (feet, legs, hips, glutes) this time, with the upper body portion taking place June 14. Great for athletes, runners, and fitness freaks of all ages–but also handy for the everyday person just looking for ways to roll out the tension on the living room floor after a long day. They say misery loves company! We’ll provide the foam rolls. Let’s have fun & “feel the pain” in this unique workshop! This entry was posted in Publication, stretching, Massage Therapy, Physical Therapy, training, exercise and tagged workshop, relaxation, physical therapy, tension, foam roll, muscle, tissue, fascia, fascial, synergists. Bookmark the permalink.